Yesterday my buddy Krista and I spent several hours browsing around and chatting with other artists at the first annual Indiana Artisan Marketplace. It was held over the weekend at the Indiana State Fairground in Indianapolis. What a cool show! 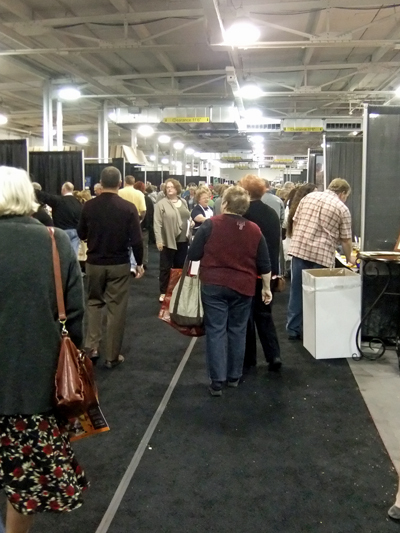 All the participants have been juried into the Indiana Artisan program (there were some additional participants from the neighboring Kentucky Crafted/Kentucky Proud group too). Artisan may just bring to mind art related products but there was quite a variety of other items to be seen & sampled throughout the show. Musical instruments, soaps, bath & body products, handmade papers & yarns, several different Hoosier vineyards (with free samples!) and many, many food products (with even MORE free samples!). There were also arts organizations from around the state promoting the cultural venues in their areas. Future road trips perhaps?! After we had wandered a while I thought it would be fun to take some photos of a few of the items we saw. Naturally I took photos of some artists I knew, in addition to a few whose wares I just admired. So here is a mini-tour for you, via photographs, in case you weren’t able to attend! 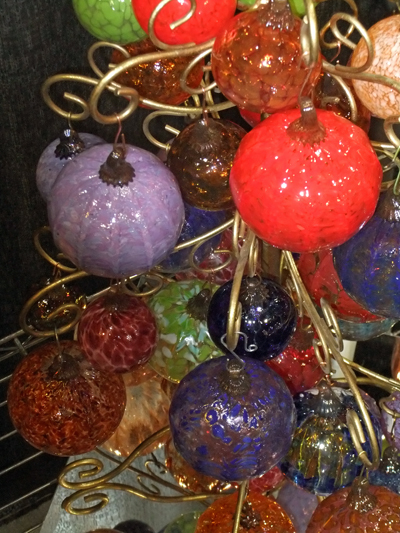 A close-up image of some blown glass ornaments from artist Lisa Pelo-McNiece at Hot Blown Glass, located in Clayton, Indiana. 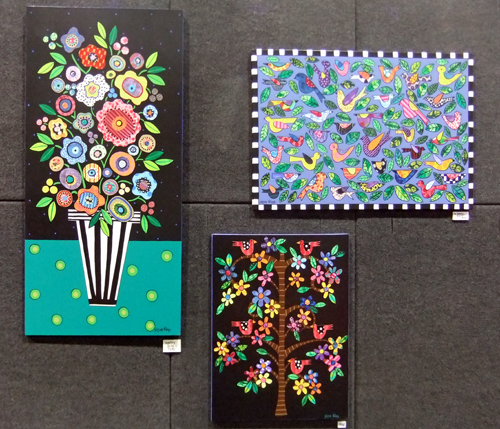 Lisa makes some gorgeous creations with glass…I’m happy to have a few of her pieces in my personal collection of art! I love the colors of her scarves! 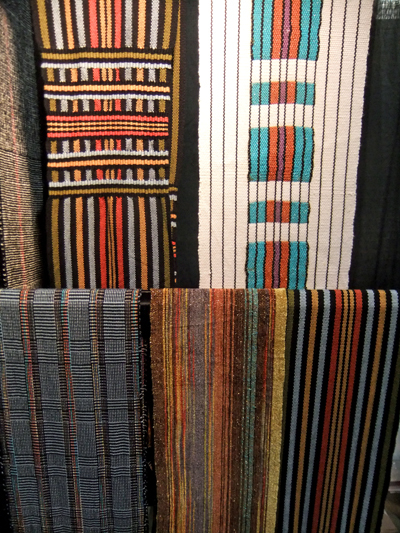 Suzanne designs/weaves apparel and home furnishings and also gives weaving instruction. She is from Bloomington, Indiana. If anyone wants to buy me a really early Christmas gift I love the white scarf with the turquoise design! 🙂 Suzanne’s website www.suzanneehalvorson.com if you want more info. shoppers/samplers in the food aisle! Ahhh, the food/wine aisle! 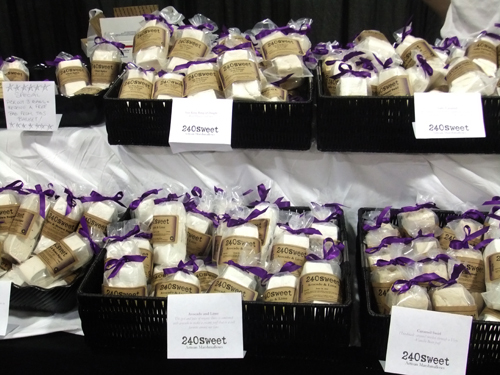 There were treats to be had of all varieties – and lot of people willing to sample them! This photo is from a shop that sold delicious flavored marshmallows, they even had a small burner that they would toast them over before you sampled them! Located in Columbus, Indiana you can read more about them at www.240sweet.com. This was the closest shop to photograph when I was taking pictures, so as not to play favorites I also enjoyed sampling “Simply Divine Bakery” cookies, baked in the monastery by the Sisters of St. Benedict in Ferdinand, Indiana, toffee by Brookes’ Candy Company in Dana, Indiana, beef & noodles made with hand-made style noodles by Coe’s Noodles in Lynn, Indiana, pretzels by Tell City Pretzel in (you guessed it!) Tell City, Indiana. We also sampled wines from a two wineries we hadn’t tried before (it’s kind of a become a hobby the last few years so a new winery is a a fun treat!) – French Link Winery from French Link, Indiana and also Winzerwald Winery from Bristow, Indiana. I know we also snuck in a bite of fudge, some hot salsa, and a couple of other treats but I wasn’t paying close enough attention to give credit to the right companies! 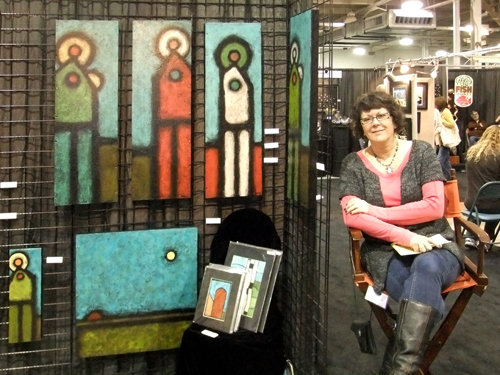 Here’s my artist-friend Teri, in her booth with some of her awesome art! Teri lives in Indianapolis, Indiana. Want to see more? Visit her website at www.teribarnett.com for lots of other images and info. 🙂 Teri is also the co-owner of Broad Ripple Art & Design who represent Mark & I! Wow! Did these grab my attention! Let alone the lovely colors there were fountains too. These are made by Kris Busch of Bloomington, Indiana, check out her website at www.functionalceramics.com for more of her work. So that’s the end of your mini-tour…just think how long this post would be if I’d had my camera out from the beginning of the show!! 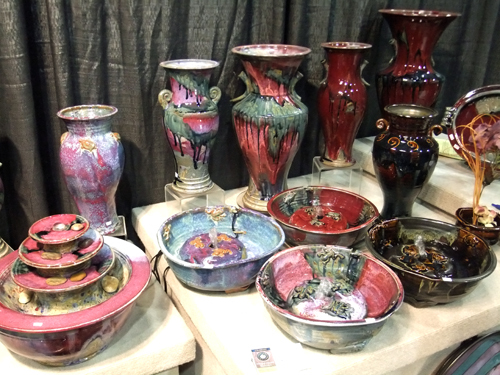 You can find out more about the Indiana Artisan program by visiting their website at www.indianaartisan.org. You can also find listings for all the artisans that weren’t mentioned in today’s blog. Enjoy!